Recently, after checking which is the currently most used resolution among all devices I was surprised to find out that we have a new leader - the 360x640px resolution. What causes the surge of the 360x640 resolution? 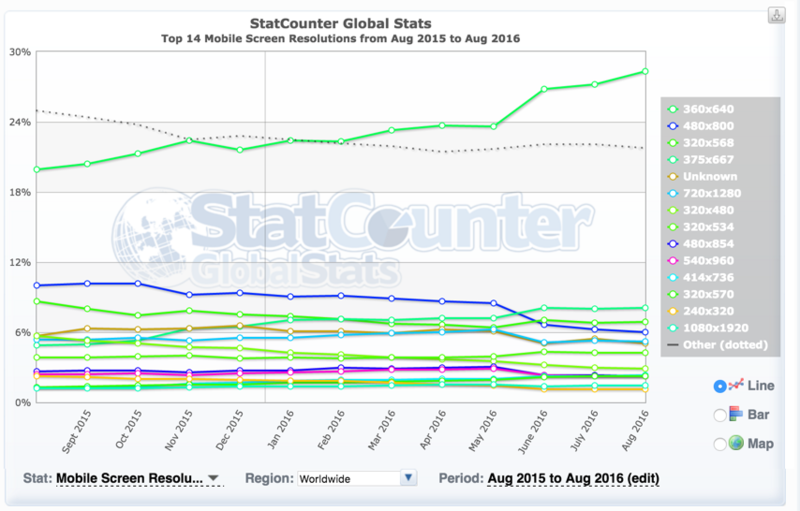 Update: The mobile resolution has already significantly passed the desktop resolution as the most used one. High-density screens can be a bit confusing, a pixel isn't just a pixel anymore: the actual pixel count is a multiple of the declared pixel count. 360x640 pixels, at 200% DPI, is 720x1280 -- which is the viewport size of the HDTV standard (aka 720p). At 300% DPI it is 1080x1920 -- which is the 1080p standard. 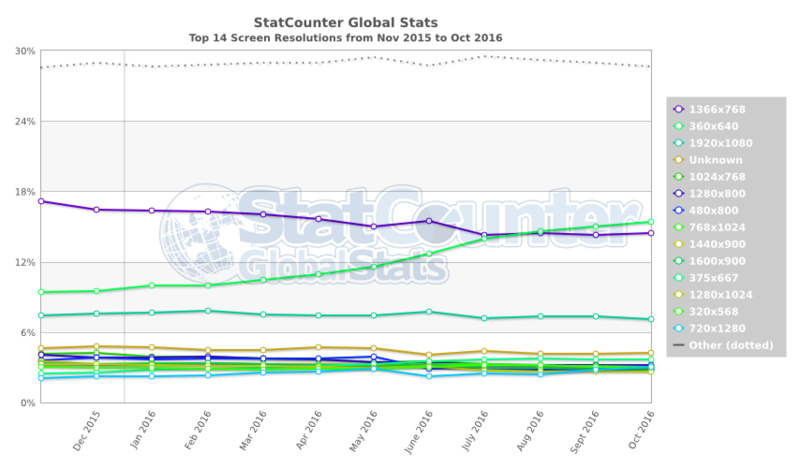 Switch the chart to resolution for mobile only. There's your answer. Mobile Phones (whatever statcounter classes as such) are skewing the results (well, it's not really skewed as it's correct). Mobiles are being used more and more for accessing the web. This just illustrates that. According to this page, Samsung S3, S4 and Galaxy Note are such phones, and are the top selling android devices currently. And android market share far eclipses iOS. Note: There may also be some quirks with how mobiles declare themselves to the sites. Retina / HD screens may claim 640 x 460 so that it doesn't display as really small / zoomed out versions. 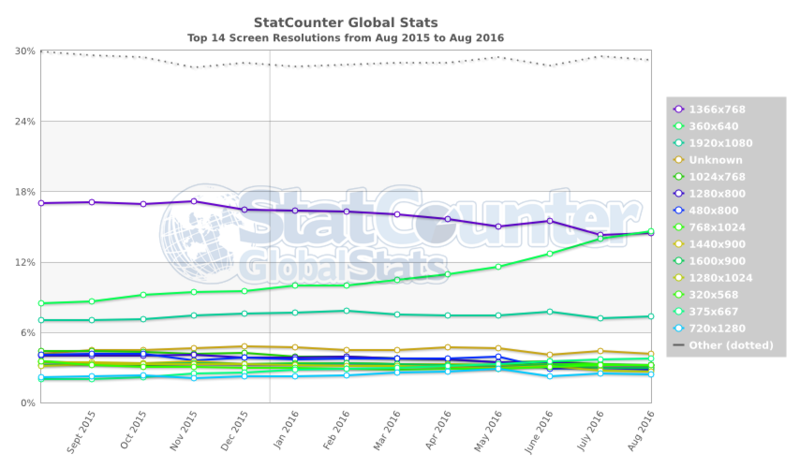 Screen resolutions in this day and age aren't as black-and-white as they used to be a few years ago. A bit like cameras with their Megapixels - it's a stat that becomes less meaningful as technology evolves. Not the answer you're looking for? Browse other questions tagged mobile screen-resolution or ask your own question.